The native form of this personal name is Fricsay Ferenc. This article uses Western name order when mentioning individuals. Ferenc Fricsay, jan. 1. 1941. Ferenc Fricsay (Hungarian pronunciation: [ˈfɛrɛnt͡s ˈfrit͡ʃɒi]; 9 August 1914 – 20 February 1963) was a Hungarian conductor. From 1960 until his death, he was an Austrian citizen. Fricsay was born in Budapest in 1914 and studied music under Béla Bartók, Zoltán Kodály, Ernst von Dohnányi, and Leó Weiner. With these and other faculty at the Budapest Academy of Music he studied piano, violin, clarinet, trombone, percussion, composition and conducting. 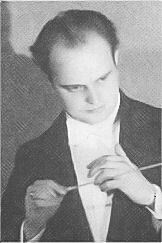 Fricsay made his first appearance as a conductor at age 15, substituting for his father at the podium of the Young Musicians Orchestra of Budapest. In 1930, at the age of 16, he succeeded his father as conductor of the Young Musicians Orchestra. On graduating in 1933, Fricsay became repetiteur for the chorus of the Budapest Opera; then, from 1933 to 1943, he was music director of the Szeged Philharmonic Orchestra in the third largest city in Hungary; he also served as director of its military band from 1933. In 1942, he was court-martialed by the government of Miklós Horthy for wanting to employ Jewish musicians, and for having "Jewish blood" himself (according to reliable reports, his mother was Jewish). When the Nazis occupied Hungary in 1944, the chief editor of the Szeged daily newspaper warned Fricsay that the Gestapo planned to arrest him; he and his wife, Marta (nee Telbisz) and three children Marta, Ferenc and Andras, avoided this fate by going underground in Budapest. In 1945, secret emissaries offered him the co-directorship of the Metropolitan Orchestra of Budapest (later Budapest Philharmonic Orchestra); he also became principal conductor of the Budapest Opera. He conducted opera at the Vienna Volksoper and at the Salzburg Festival in the late 1940s, including world premieres in Salzburg of operas by Gottfried von Einem ("Danton's Tod" in 1947) and by Frank Martin ("Zaubertrank" in 1948). The enthusiastic reception of Fricsay's work on this international stage led to his being appointed Chief Conductor of the Berlin RIAS Symphony Orchestra and General Music Director of the Deutsche Oper Berlin, from 1949–1952, performing then in the Theater des Westens. He made his United Kingdom debut at the 1950 Edinburgh Festival, leading the Glyndebourne Opera in Mozart's Le Nozze di Figaro. He made his Buenos Aires debut that year with Carmina Burana. In 1951 he made his debuts in Italy and with the Royal Concertgebouw Orchestra in Amsterdam. In 1953 he made his debuts in Paris, Milan, Lucerne, and the USA, where he conducted the Boston Symphony Orchestra and San Francisco Symphony. He was appointed musical director of the Houston Symphony in 1954, but resigned halfway through the season over "disagreements on musical policy." The true reason involved US tax policy. He discovered that under the Internal Revenue Code he would have to declare income earned throughout the world in his US tax return as long as he spent more than 6 months residing in the United States. His contract with the Houston Symphony would have resulted in having his income becoming subject to prohibitive US tax rates. When he became aware of this problem he abruptly left Houston for Switzerland. He made his debut with the Israel Philharmonic in 1954. He spent much of his time from the 1950s onward in Germany as music director of the Bavarian State Opera (1956–1958) and as conductor of the RIAS Symphony Orchestra, the Deutsche Oper Berlin and the Berlin Philharmonic. Also in 1956, he was appointed General Music Director of the Munich Court Opera, a position he held until 1958. Fricsay gave his last concert on 7 December 1961 in London where he conducted the London Philharmonic Orchestra in Beethoven's Symphony No. 7. He suffered from repeated illnesses throughout his life and finally succumbed to cancer of the stomach on 20 February 1963 at the age of 48 in Basel, Switzerland. Fricsay was known for his interpretations of the music of Mozart and Beethoven, as well as that of his teachers Béla Bartók and Zoltán Kodály. His 1958 recording of Beethoven's Symphony No. 9 is featured in the movie A Clockwork Orange. He conducted without a baton, according to the entry in New Grove, but "confounded the adverse critics of this technique by the extreme clarity and precision of his performances," to which it also ascribes "a dynamic spirit" and "vividness of character in familiar classics." From the 1950s until his death, he recorded for the Deutsche Grammophon record label. He led the inauguration of the rebuilt Deutsche Oper Berlin with a performance of Don Giovanni on September 24, 1961. A video of this performance has been issued on DVD. ^ a b "Dirigent Ferenc Fricsay". Fricsay.net. Retrieved 2012-01-21. ^ a b Noel Goodwin (1980). "Ferenc Fricsay". New Grove Dictionary of Music and Musicians, v. 6. Macmillan. p. 844. This page was last edited on 30 October 2018, at 07:58 (UTC).